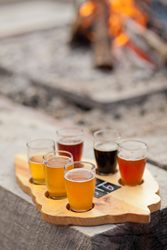 This November 10-17 Traverse City Tourism invites you to take a gulp of the eclectic microbrew scene in Traverse City and northern Michigan. Celebrating the ever-evolving craft beer industry of northern Michigan, the Traverse City brewing community will raise their pints once again for the fifth season of Traverse City Beer Week (TCBW) November 10-17. The Imperial Beverage week-long celebration includes several events, each one developed jointly between brewers, restaurants and retailers to educate or offer insight into some aspect of the craft beer movement. Whether that be a special product or style of beer, a food-beer pairing experience or some other topic of interest, each year the lineup varies. This year’s events include the TC Ale Trail IPA Challenge, the TCBW Pub Crawl, the Flapjack and Flannel Festival, the Tour de Taco, the Great Beerd Run at Grand Traverse Resort and Spa, plus more events added to the mix every day. For a regularly updated list of TCBW festivities, check out traversecity.com/tcbw. Traverse City Tourism President and CEO Trevor Tkach is looking forward to the hoppy times in and around the Cherry Capital of the World. “Traverse City is filled with creative entrepreneurs who have made a profession doing what they love. Our brewing community is a bold example of that, and in doing so, they’ve added a fresh, cultural flavor that both visitors and residents enjoy,” Tkach commented. And it’s a culture that’s allured countless food and drink enthusiasts around the world. Traveling participants of TCBW are invited to save on their northern getaway with Traverse City Tourism’s Fab Fall Special. Book discounted lodging and score savings on downtown dining, entertainment and more through December 15 at fabfall.com. TCBW partners remind guests to enjoy festivities responsibly and to utilize local transportation if needed.